Haste! w/ Special guest Smiles. Gamer Wisdom, DDI Goes Dark, Tabletop SFX, and More! The Vanguard program is coming, full blog post explaining the details soon. There’s a Halloween caption contest that you should all be rushing to get funny on, and finally – the Reforging launch will be this Monday, October 28th! A recent article up on Gnome Stew explores the many pros of playing tons of different tabletop RPGS. Martin Ralya has played 75! He reflects on things to learn from playing different games and encourages us all to do the same and never stop. How many games have you played? Do you think multiple games makes you a better gamer? Let us know! 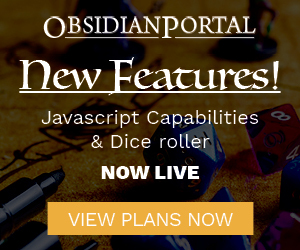 A recent post on the WotC forums indicates that Dungeons & Dragons Insider will no longer be posting or upkeeping 4e material after March of 2014. We speculate wildy about what this may mean for the future of D&D. The second Kickstarter from Platemail games is live, it’s full of awesome sound effects and some more ambient tracks for your games. If this is your thing, definitely swing by the Kickstarter and pledge. We discuss the logistics of actually using stuff like this in your game. Micah discusses the reforge launch, slated for Monday, October 28th! @ClampController asks: Do you guys have any interesting tricks for highlighting environments key to certain classes (ie Ranger/forest)? Listen to find out our answers!